The Final Big green Show of 2016 opens in under 48 hours! Last chance for FREE tickets. Tomorrow marks the last chance for show visitors to secure free tickets and save on the £12 door price. The link for free tickets is here. Artizan heating & Firepower have a Smart 120 traditional pellet stove and a stunning feature wall with the double sided Fondis Stella 3 DFH700 Inset Stove. 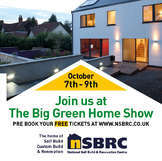 You can find us on stand 155. Opening Times: The show is open to the public from 9:00 each day with the seminar programme commencing from 10am. Please ensure you arrive in plenty of time. The show closes at 17:00 on Friday & Saturday and at 16:00 on Sunday.